Throughout Kenosha County, you’ll find a large selection of commercial and industrial sites and buildings. Listed below are some of the business parks located throughout Kenosha County. Need help? KABA is always a good place to start – our team knows the Kenosha County market inside and out. 94 Logistics Park is a three phase project consisting of over 3.4 million SF on 225 acres located in the City of Kenosha off of Interstate 94 adjacent to Amazon and Uline’s Midwest Operations Center. Proposed site plans include availabilities ranging from 100,000 SF to 1.6 million SF. The Badger Logistics Center is an 88 acre build-to-suit ready parcel located in the Village of Pleasant Prairie off of Interstate 94 and just north of LakeView Corporate Park. Proposed site plans include space up to 1,180,000 square feet within a single building. The Bristol Business Park is an approximately 90 acre industrial park located just east of Highway 45 in the Village of Bristol. 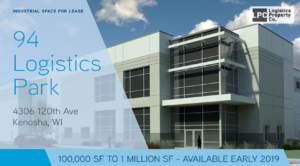 There is 25 acres of land for development available as well as approximately 60,000 square feet of building space ready for sale or lease. The Business Park of Kenosha is a 235 acre, 2.6 million square foot industrial business park development located in the City of Kenosha. The park features well spaced, larger lots and is within one mile of I-94 and directly across from the Kenosha Regional Airport. First Park 94 features 309+/- acres zoned for industrial use in the Village of Somers on the north end of Kenosha County. Sites can accommodate build-to-suits from 150,000 SF to 1,500,000 SF and many of them have frontage along Canadian Pacific Railroad with potential rail access. It is eight miles north of the Illinois/Wisconsin border and is accessible to I-94 via (3) four-way interchanges. The Kenosha Industrial Park is located of Hwy 158, just west of Green Bay Road in the City of Kenosha. It is approximately 3.5 miles from I-94. The first phase of the Kenosha Industrial Park was completed in 1974, and a second phase is now in development. The approximately 85 additional acres will have sites that range in size from 2 to 15 acres, ideally for growing manufacturing or service-based companies looking to expand. As the largest industrial park in the state of Wisconsin, the LakeView Corporate Park is unique in offering master-planned, mixed-use development sites in a naturally beautiful park-like setting. Located in the Village of Pleasant Prairie, the park is conveniently located off Interstate 94 at Route 165 in Kenosha County. LakeView is home to more than 80 diverse companies employing over 8,500 people and representing over 10 million square feet of development on 2,000 acres of land. The 228-acre property, located at 5522 104th Ave., south of Highway 158 and east of I-94, can accommodate up to 2.3 million square feet of new buildings. It is the site of the former Dairyland Greyhound Track. A conceptual plan for the property includes five buildings ranging from 120,000 square feet to 650,000 square feet. The Midwest Transportation Center is a 120-acre business park – divisible to 60 acres – located in the heart of the City of Kenosha. Served by the Union Pacific and Canadian Pacific Railways, transloading services are available on-site. There is 8,000 lineal feet of storage track on-site as well as inside or outside rail loading. The Village of Pleasant Prairie recently purchased approximately 458 acres of highly desirable land at the northwest corner of County Highway Q and I-94. This land, along with an adjacent property owned by the Village, is being developed as a new corporate park, Prairie Highlands, with a focus on manufacturing, office and commercial uses. The park is just a couple miles north of the WI/IL border and has frontage on I-94. The Town of Salem Lakes, Kenosha County and the Kenosha Area Business Alliance partnered on the development of a first-class business park in Western Kenosha County. The Salem Business Park is a 65-acre park located northwest of Highway 83 and Highway C just north of the Illinois border. There are sites of all sizes – ranging from two to ten or more acres. It has a flexible subdivision plan; fully improved infrastructure: sewer, water, road, curb, gutter and grading; and protective/flexible covenants. Ready to partner with you as you grow. Grab a chair - there's a lot.